﻿ How to play locally stored video on Chromecast-enabled TV? How to play locally stored video on Chromecast-enabled TV? Nowadays, it is popular to stream media from local disk, website, media devices to TV. The Chromecast, a low-cost streaming media device from Google, makes it easy to play online video and music from iOS or Android devices to TV, but locally stored videos seem not supported. Is it possible to play personal local videos that are stored on PC or Mac with Chromecast? Do you want to stream local AVI, MKV, MP4 or MOV movie on Chromecast enabled TV? Is there any way to Chromecast local media to TV without iOS or Android devices? Videos from video-sharing websites: You can stream online videos from sites like YouTube, Netflix, and Google Play Movies. Just download their APPs and select the movies you like. Click Cast button which can be found on a very visible place. Then the videos will be played on TV. A total of 17 sources are supported, including VEVO, Red Bull.TV, Songza, PostTV, Viki, Revision 3, BeyondPod, Avia, RealPlayer Cloud, Plex, Netflix, Hulu Plus, HBO GO, Pandora, YouTube, Google Play Movies and TV and Google Play Music. If you have YouTube account, uploading your local videos to view on Chromecast enabled TV is a possible solution, but not the best one. Videos stored on PC or Mac local disk: If you don't want to waste time on uploading video to web or you do not have any iOS or Android device, how to play locally stored video on Chromecast-enabled TV? There is an easier way to Chromecast local videos to TV directly without portable device or Apps. The Chromecast can play back local media on PC or MAC running Google Chrome with Google Cast installed. Copy the local path to URL box or just drag videos to Chrome. Then click Cast button and the local videos will be streamed to TV directly. According to official website, supported media types are: MP4, WebM and MPEG. However, you may have other format videos, such as AVI, MOV or MKV. How to play such format local videos on Chromecast-enabled TV? Bigasoft Total Video Converter is just the ideal locally stored video to Chromecast TV converter which is able to solve can't Chromecast local media files to TV issue. The following article will show you how to Chromecast any format video from local disk to TV. 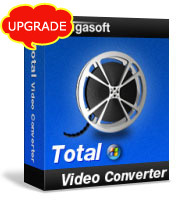 Step 1:Free download and launch Bigasoft Total Video Converter Bigasoft Total Video Converter. 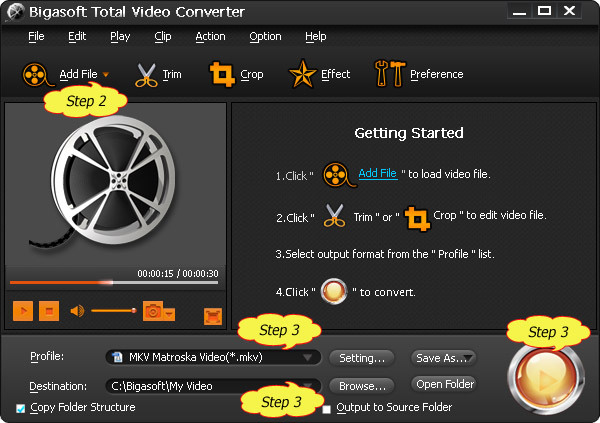 Step 2: Add the local videos which can't be added to Chrome into Bigasoft Total Video Converter, such as VOB, AVI, FLV, WMV, MKV, MOV, etc. Step 3: Select WebM Video (*.webm) profile and path for Destination. Then click Convert button to start and finish converting any format videos to Chromecast supported WebM for playback on Chromecast enabled TV. Drag output WebM videos directly to Chrome and click Cast button. The locally stored videos will be played well on TV. 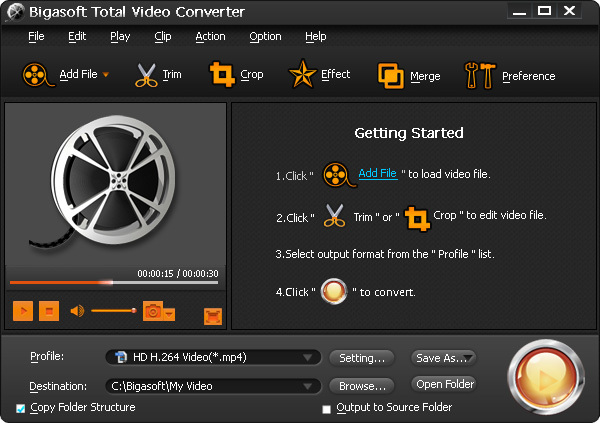 Acting as an ideal streaming video converter, Bigasoft Total Video Converter can help you add any locally stored video, not only mp4, WebM, MPEG, but also VOB, AVI, FLV, WMV, MKV, MOV, on Chromecast-enabled TV via Chrome. How to Solve MKV Wouldn't Cast with Sound through a Chromecast?